Additional Info: I decided to try something a little different today. The recent decision by the CMS not to cover pharmacogenomic testing for warfarin sensitivity prompted me to revisit some of the data concerning warfarin dosing. This is a figure from a NEJM paper from 200. Full attribution is provided on the figure. The work is NIH funded and the entire article can be found at the pharmacogenomics knowledge base or the NEJM web site. A little background is given below. Opinions on the CMS decision are more than welcome! Warfarin is an anticoagulant drug that is prescribed to high risk individuals with increased propensity for thrombotic events. For most indications, therapeutic doses of warfarin elevate a patient’s INR (a measure of clotting activity) to between 2 and 3, from a normal value of 1. Determining the optimal dose of warfarin for an individual patient to reach this narrow therapeutic window can be a challenge. Over-anticoagulation can lead to life threatening bleeding events, while under-anticoagulation can be equally dangerous due to thrombo-embolic events. 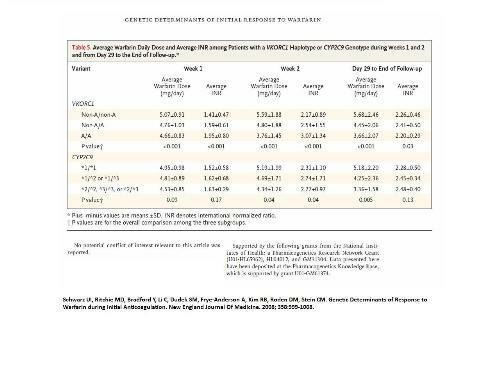 Polymorphisms in two genes, VKORC1 (the VKORC1 c.-1639A polymorphisms) and CYP2C9 (the CYP2C9*2, and CYP2C9*3 polymorphisms), can affect the sensitivity of an individual patient to warfarin1. Thus, knowledge of a patient’s VKORC1 and CYP2C9 geneotype can be used to help guide warfarin dosing decisions. CYP2C9 is one of the main enzymes that metabolizes warfarin. A number of polymorphisms exist in the CYP2C9 gene that results in single amino acid differences in protein sequence and subsequent differences in enzymatic activity. Among these, the best clinically defined are the CYP2C9 alleles CYP2C9*2, and CYP2C9*3. In general, individuals with the *1/*1 genotype have a relatively rapid rate of warfarin metabolism and individuals with the variant genotypes have a comparably slower rate of warfarin metabolism. Consequently, individuals with a variant genotypes (containing one or more *2 or *3 alleles) on average require smaller warfarin doses to achieve therapeutic anticoagulation. VKORC1 is the therapeutic target for warfarin. Within the promoter of the VKORC1 gene, there is a polymorphism at c. -1639 which affects its expression. VKORC1 c.-1639G is the normal allele. VKORC1 c.-1639A is the variant allele with reduced expression. In general, to achieve therapeutic anticoagulation, individuals with the c.-1639 A/A and A/G genotypes require a smaller dose of warfarin than individuals with the G/G genotype. Some have proposed testing for these polymorphisms as a means of determining an individualized and optimized dose of warfarin.